In last selenium conference, which happened in Bangalore India, selenium founder Simon Stewart announced selenium 4 newly added features and release date for Selenium 4 . Every test automation engineer should know these new exciting updates coming in selenium 4. 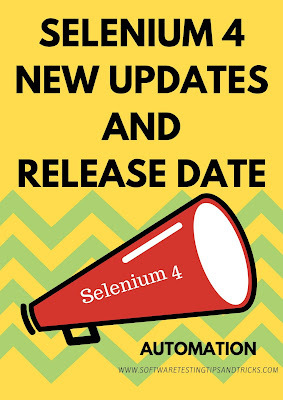 Selenium 4 will be release during the last week of December around Christmas this year. Current version of selenium which is Selenium 3 i.e selenium web-driver 3, supports browser automation with multiple programming languages like java, C#, ruby, python,php etc. In the last selenium conference selenium 4 is announced with new updates and features. So these are all the features which will be available in selenium 4. This means Selenium 4 will have w3c standardize web-driver which will interact with browser directly. So, there will be no need of Json Wire protocol. This means better compatibility across different automation tools which uses web driver API. You can find contribution and work done on GITHUB after release. Selenium Grid is used to run tests in parallel. We all have encountered many performance and other minor issues with it. These got fixed in selenium 4 and we will have new simpler and efficient Grid. Also, User Interface will be improved too. There will be better support for Docker and Kubernetes. Selenium was started with selenium IDE but it was neither maintained nor improved properly. But in selenium version 4 new selenium IDE will be available for both Firefox as well as for chrome. It will have new command line support as well as parallel run support. Selenium 4 will now also Support play back as well. It is currently in alpha state. Selenium documentation got lot of contribution and they focused more on documentation this time. So, we will have improved and detailed documentation with selenium 4. Selenium's official website seleniumhq.org will be redesigned with improved UI. 6. Will Existing Scripts affected? There will be very minimal changes for existing scripts. If some libraries will be removed, you have to remove that from your code and add new ones. But as discussed in conference there will be very minimal changes required. How to start automation with selenium webdriver. So, these are the all the features which will be available in selenium 4. Please like our facebook page , follow us on google plus and twitter. 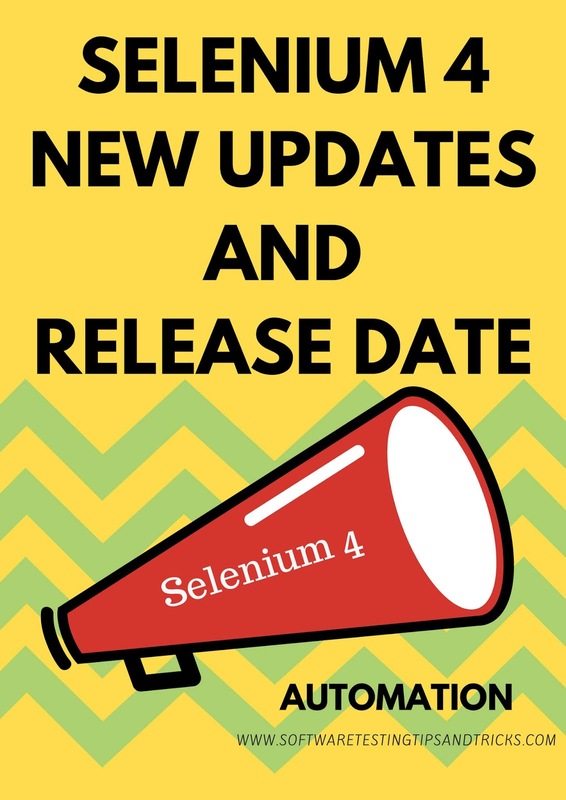 Watch below video for more info on selenium 4 release date and new feature as discussed in selenium conference 2018. What is monkey testiing ? Should you try Monkey testing for your product ? Top 10 reasons why software testing is important ?